Collective action can accomplish anything, from overthrowing an oppressive monarchy, to moving an oppressively heavy couch. Now, collective action can get you the best deals in Seattle, with Tippr. Tippr's a homegrown collective-buying service that offers epic steals at the Queen Emerald BadmotorCity's most popular restaurants, bars, salons, retailers, events and more. Even more stupendously, the more people buy in on the deal, the better it gets for everyone, starting at 50% off, all the way up to 90% off -- a process called "accelerated buying" that Tippr actually owns the patent for, just like Alexander Graham Bell owned the patent on the telegraph, and Jay Buhner owns the patent on the machine that makes you terrifying yet strangely beautiful all at once. Stellar offerings so far have included $25 off food at Italian standby Via Tribunali, $30 off a haircut & straight-razor shave at Oslo, A Men's Store, and one of today's deals: $40 standup paddleboat & wetsuit rentals at Surf Ballard -- and no, that has no relation to Russ Ballard, the British singer/songwriter behind the 1984 hit "Voices". God, you're so random. 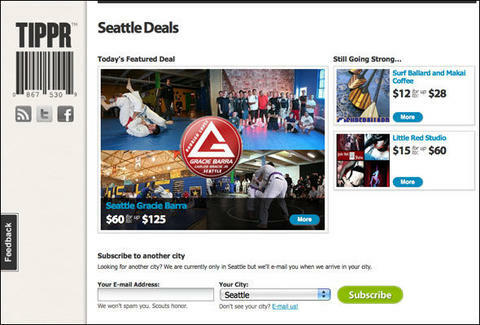 Tippr's daily deal newsletter is free and everyday features new local places to eat, shop, and play in Seattle. Sign up through this email, and you'll be placed in the running for a $100 gift certificate, which you can put towards whatever hot Tippr action you want, bringing great happiness to your collective soul.